I really started participating in SOTA back in May 2012 – prior to this I had only Chased nine (9) activations, a rather casual effort after the start of SOTA in VK3 in February 2012. I combined my trip to the WIA AGM and Conference in Mildura with some SOTA and National Parks activations. 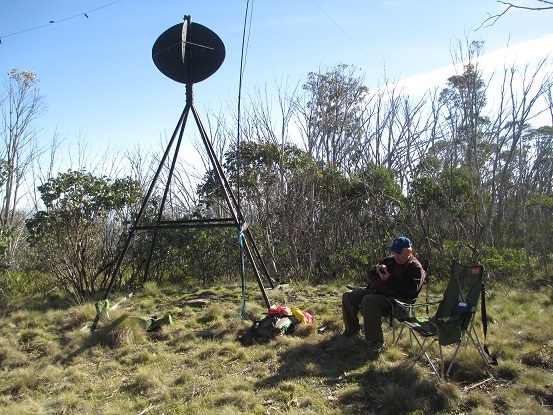 My first activation combined SOTA and the Keith Roget Memorial National Parks Award, with an activation of Mount Ida in the Heathcote-Graytown National Park. This started a theme – try to activate summits that are inside a National Park. I strongly dislike the heavy traffic often associated with the start (or end) of a long weekend, so deliberately planned to start my trip on Good Friday. I got away at a reasonable time and headed for Bairnsdale and then up the Great Alpine Road to Swifts Creek. From there, it was off to the west, then south west along Brookville Road. The road is sealed to just beyond Brookville and you simply remain on the main road, which becomes Mount Baldhead Road. I proceeded to the west of the summit and engaged low ratio in the Forester to tackle Baldhead Track – very rough! As I got closer to the summit, it was clear that the southern slopes just west of the summit had been subject to recent logging operations – I had passed a track junction about 1.3 km before the track junction which was labelled with signs indicating a “construction zone” a.k.a. logging area. You can drive all the way to the summit, which has a radio comms facility and a trig point. I parked between the two and walked down the track to the north east to exit the AZ before returning to set up at the trig. I made 32 contacts, with S2S to VK3EK/p and VK1DI/p, before I packed up and headed off to the next summit. I exited the summit by following the main logging road down, coming out at the point I had seen on my approach. It could be tackled by a 2WD vehicle, unless conditions were very slippery. I initially headed south, to check out another summit which had not yet been activated: VK3/VG-051. The weather was looking very threatening, plus this summit would need a bush-bash approach of about 600 m with a climb of about 90 m vertical through thick undergrowth. I decided that this summit could wait and retraced my steps toward Mount Baldhead and then on toward Mount Delusion. Once back on Mount Baldhead Road, head north to the junction with Grassy Ridge Track. This “track” was in excellent condition for a quick drive along the ridge line to Mount Delusion Road. I choose to head around on Mount Delusion Road to the western side of the summit, then climbed up Mount Delusion Track to just below the edge of the AZ to park, then walked up the track to the high point then headed through the bush toward the summit. There was a single strand barbed wire fence to cross en route, at about knee height. The summit is rather broad and poorly defined. I set up in a small clearing, simply hauling the antenna centre up over a tree branch only about 3.5 m above ground. I made 28 contacts, including S2S with VK3EK/p. After briefly trying 12 and 20 m without success (no mobile coverage, so no opportunity to spot), I packed up and headed back down. Back at the car, I drove back down to Brookville via Mount Delusion Road, then on to Swifts Creek. I was undecided on any further target/s, until I was caught behind several very slow vehicles on the climb towards Omeo around Tongio. I decided to take a “scenic” detour via Tongio Gap Road – it could not be slower than following 2 large trucks and several 4WDs all the way up the long steep hill. As I was heading toward Tongio Gap, I remembered that there was an 8 point summit north of Tongio Gap, so decided to tackle that summit. Near the ABC MF transmitter facility just north of Tongio Gap, turn north east onto Splitters Range Road. The road initially heads through farm property, with 2 gates and some nasty potholes to negotiate. The road then climbs upwards toward the summit, with good road conditions. I set up just below the highpoint. I made 25 contacts, including S2S with VK3EK/p on Mount Baldhead. After working the chasers on 40 m, I decided to pack up as the weather felt as if it was about to get very wet. 5 minutes down the track it started raining….. I headed into Omeo, then across Mount Hotham on the Great Alpine Road and onto Wodonga, with lots of rain along the route. I had made contact with Mark VK3ASC via email a week or 2 before Easter, asking if he was interested in a joint activation. As it turned out, his initial plans changed. We organised a joint trip along the tracks north of Tawonga Gap. We met at Bandiana on Saturday morning, then agreed to travel separately to Tawonga Gap. We then headed north along Tawonga Gap Track to the first track junction to the north. I left the Forester there and jumped in with Mark and his wife Kathleen. The track rapidly became steeper and rougher – I was glad that we were in Mark’s Hilux. We drove across the top of VK3/VE-113 and on toward VK3/VE-092. We parked not far from the summit and followed the required access requirements prior to setting up using a sapling to hold up the squid pole. Virtually as soon as the gear was set up, we heard Rod VK2TWR/p on VK2/SM-083, the first of 22 contacts, including S2S with VK2TWR/p, VK3EK/p and VK2IB/3. Bernard VK2IB/3 was on the opposite ridge to us, so his signals were very strong. Once I had comfortably qualified the summit, I handed the mike over to Mark. When a S2S opportunity came up, we both worked the other activator. We eventually worked all takers and then headed back along our route in, back to VK3/VE-113. The routine was the same as for the previous summit: park, approach the summit, set up and start working stations, sharing activation duties and both working any S2S opportunities. I made 14 contacts, including S2S with VK2MT/p, VK2TWR/p, VK3EK/p, VK2IB/p and VK1MBE/p. I worked John VK6NU on 12 m and made 3 contacts on 20 m.
It was then back to the vehicle and back past the parked Forester and up to the next summit. More of the same for this one. I made 17 contacts, starting with a S2S with VK2MT/p. Other S2S contacts were with VK1MBE/p, VK3EK/p, VK2TWR/p and VK2IB/3. 3 contacts were on 20 m and one on 12 m.
Mark and Kathleen drove me back to my Forester and then headed back over VK3/VE-104 to find a camping site further west along the ridge, ready to tackle 2 more summits on Sunday. I headed back to Tawonga Gap, and then back to Wodonga for the night. I headed south from Wodonga on Sunday, heading to Mount Beauty and then up to Big Hill Road and then to West Kiewa Logging Road. From the maps, there appear to be 4 approaches to Big Hill. Forest Explorer showed then all as Management Vehicles Only. On the off chance one approach might be open, I headed along West Kiewa Logging Road to check the start of all 3 western tracks – all gated & locked. I headed back to the first access route at the junction of Big Hill Road and West Kiewa Logging Road and parked by the gate. The approach was a walk of about 3.5 km with a climb of about 350 m vertical. I made 34 contacts, including S2S with VK1MA/p, VK3ASC/p, VK2HRX/p and VK3WAM/p (CW/SSB). Only 1 contact was made on 12 m and 5 on 20 m, including John VK6NU. After about 50 minutes on the summit, I packed up and headed back down to the car, then back to the Bakery in Mount Beauty for a late lunch. I then headed back toward Wodonga, with a significant detour to activate Mount Jack Range. My approach to this summit was again via Rose White Track. I set up beside the track close to the high point, with the antenna running NNW-SSE. My first contact here was with Matt VK1MA/p on 12 m, the first of 24 contacts, including additional S2S with Ian VK5CZ/p on 40 m and Ed DD5LP/p (VK2JI) on 20 m. It was great to work Ed from a German summit. The day was getting late, so I packed up headed back to Wodonga. Monday was a “rest day” – time to meet Warren VK3BYD for a long coffee and chat at the Chiltern Bakery, and then family activities for the rest of the day. This time I headed down Lockhart Gap Road and on to the Omeo Highway. I soon wished that I had left about 15-20 minutes earlier – I got stuck behind a convoy of 4 Army heavy duty tow trucks, each with a truck in tow. Passing opportunities were limited, so it was a slow climb to Lockhart Gap! I headed beyond the turn off for Mount Wills and tried to get to The Knocker. Knocker Road looked to be in perfect condition for an unsealed road, but had signs at the junction with the Omeo Highway about logging activities, road construction, and a large Road Closed sign. So I did the right thing and headed back to the Mount Wills turn off and up to the car park about 1.5 km up the hill. From the Omeo Highway, head up to the car park at the 2 gates. Park near the gate to the Ski Club. It is then a walk of about 3 km with a climb of about 330 m vertically to the summit. It took me about 1 hr 20 min to make the climb. I had a quick look at the Hut near the summit prior to setting up between the summit with its radio mast and the hut. My first contact was with Josh VK2JOS/p for a S2S, followed quickly with 3 more S2S, a National Park contact and another S2S. Altogether, there were 17 contacts, including S2S with VK2JOS/p, VK1MBE/p, VK3XL/p, VK1RX/p, VK1NAM/p, VK2LAX/p and VK2DAG/p. I packed up and headed back down to the car. When I got to the Omeo Highway, I crossed on to Razorback Spur Track and travelled to the junction with Wombat Creek Track, where I parked. From the track junction it was an easy walk up to the summit along Wombat Creek Track, which is subject to seasonal road closure for the winter season. Provided that there was no snow on Razorback Spur Track, this would be a prime target for a winter activation and the bonus 3 points. The climb from the junction is about 30 m over about 400 m. I set up beside the track as the summit itself looked to be covered with chest high regrowth. I made 13 contacts, all on 40 m, including S2S with VK2DAG/p, VK1NAM/2 and VK2JOS/p. I briefly tried calling on 20 m and 12 m, but no contacts eventuated – I was unable to spot myself as I had no coverage. I packed up and headed back to the car, then north on along Razorback Spur Track toward Mount Cooper. I looked at the southern and northern possible approaches to Mount Cooper. There was no sign of old vehicle tracks shown on some of the electronic maps that I have. It was a hard slog up to the summit. I made 16 contacts on 40 m, including S2S with VK2DAG/p and VK1RX/2. It was then back down through the regrowth and back to the Omeo Highway and north to Mitta Mitta, then back to Wodonga. During the approach to Razorback Range & Mount Cooper, I did notice some signs indicating planned fuel reduction burns – access to Mt Cooper might become easier IF the area is burnt. I headed back to the Omeo Highway on Wednesday and turned off at Eskdale, on to Little Snowy Creek Road, Smythes Road, Fluerty Track and Bowmans No 1 Track to access Eskdale Spur Track south of Mount Tawonga. Then headed north to Mount Tawonga. The tracks were all in good condition when I used them, although there were rougher sections on Eskdale Spur Track on the way to Mount Tawonga. I was set up by 2332 Z (Tuesday UTC), with a first contact with Rod VK2TWR/m. Altogether 16 contacts were made, including S2S with VK2DAG/p on 40 & 12 m, plus Matt VK1MA/2 on 40 m. Also worked were 4 US stations on 12 m. I closed at around 0015 Z.
I packed up and headed south. I reached the start of the track up to VE-071 well ahead of schedule and decided to head to Mount Yorke. Most maps show that Eskdale Spur Track heads across the summit of Mount Yorke. Not true today! A new track has been cut around the side on the SE side. I parked in the shallow saddle to the north of the summit and climbed up to the summit (about 600 m and approx. 110 m vertical) along the old track, skirting around the large dirt piles created to block the track to vehicles. The first of 14 contact was a S2S with Andrew VK1NAM/p. I worked VK2DAG and one US station on 12 m before packing up and heading back down. Like Mount Yorke, this summit has been bypassed, on the western side in this case. I parked at the start of the track up on the northern side and walked about 350 m and 40 m vertically to near the summit. The track to the actual summit had yellow warning tape across it, so I set up near that point – I was only a few metres below the summit proper. I started on 12 m this time, working 2 US stations and Matt VK2DAG/p on VK2/NT-009 for a S2S. Altogether, 15 contacts were made, including another contact with VK2DAG/p on 20 m.
I packed up and headed back to Eskdale. I found that the Café had very little variety on offer – I suspect that they had been “cleaned out” over the Easter weekend. I then headed to Dartmouth and up to the Mount Benambra Track. Mount Benambra Track is a bit rough in places, but the Forester coped OK with careful route choice and driving to the conditions. I parked beside the “Towerman’s Hut” and walked up to the summit, setting up at the trig point close to the large telecoms/firewatch tower. 19 contacts were made, including S2S with VK2DAG/p on 40 & 12 m. John VK6NU made it into the log on 20 m.
Today’s activities were joint activations with Bernard VK2IB/3, with Bernard offering to drive with his Hilux. We headed off from Wodonga toward Corryong, turning south onto the Corryong-Benambra Road (C545). We then turned into Scrubby Creek Track, climbing towards our first target. Once off C545, most of the tracks were not suitable for 2WD vehicles. Scrubby Creek Track climbs to a saddle west of the summit. We parked near the saddle and started the climb – about 550 m with a climb of about 70 m through relatively open scrub. We roughly followed the wombat tracks up toward the summit. I made 16 contacts including S2S with AX5NIG/p, AX3WAM/p (CW/SSB) and AX3ASC/p. As when I was out with Mark VK3ASC, Bernard and I shared duties on the mike, both working most S2S contacts. We packed up at around 0125 Z. We continued on along Scrubby Creek Track to reach Dunstans Road, then headed south to Six Mile Ridge Track which took us to close to our next summit. We set up at the high point in a small clearing, with great views to the north to our last summit. The first contact was a S2S with VK3YY/p. 18 more contacts were made by me, including further S2S with VK3EK/p, VK3HRA/p, VK3MRG/p. I also worked John VK5BJE/3 in Coopracambra National Park – National Park number 44 for me for the KRMNPA. We packed up at around 0300 Z and headed back to the car for lunch. It was then on to our final target for the day, continuing south along Six Mile Ridge Track – steep, with very loose and rocky surface! We turned right into Wheelers Creek Road to head back out to C545, then south to Wild Boar Track. Wild Boar Track was a bit rough in places – high clearance is desirable. I set up at the trig. Bernard again lugged up the 2 folding chairs to make a very comfortable portable shack (we had also used them on Six Mile Ridge). 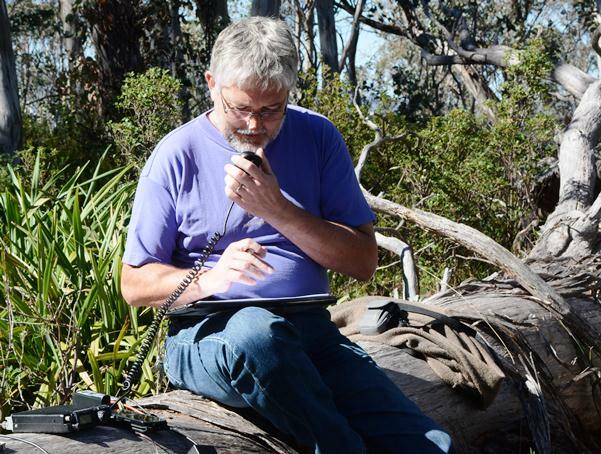 First in the log was Mark VK3ASC/p on VK3/VE-082 Mt Yorke. The fourth contact on this summit (Gerard VK2IO) took my Activator score to 1009, qualifying me for Mountain Goat. I made a total of 21 contacts, including S2S with AX3ASC/p, VK3EK/p and VK3MRG/p. I worked 3 EU stations, one VE and John VK6NU on 20 m. We had both qualified the summit and it was starting to cool down rapidly. We decided not to hang around to work the Europeans, packing up at around 0540 Z. We simply retraced our track to C545 and then headed back to Wodonga, with both of us tired and very satisfied with the day’s activities. After a leisurely start, I packed the car and started the trip toward home. I decided to take the Great Alpine Road with a detour near Bright. Mark VK3ASC had the honour of being the first activator of this summit on Easter Sunday. My approach was via Mount Porepunkah Road and then up Tawonga Gap Track. This was steep and loose in places, requiring me to use first gear in low ratio at times. I parked near the summit & exited the AZ via the track, returning to set up on the summit. There was no mobile coverage on the summit, so I kept operations to 40 m. I worked 23 stations including S2S with VK3CAT/p, VK3AFW/p and VK2HRX/p. I packed up and headed down toward Bright. 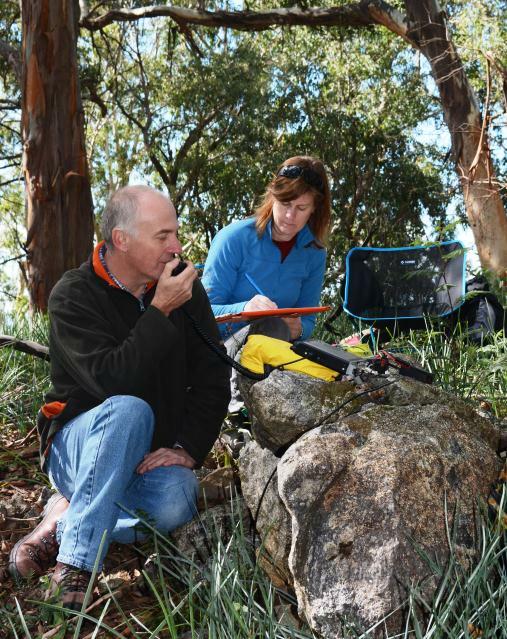 On reaching the bitumen, I heard stations calling John VK5BJE/3 in Errinundra National Park. I found a spot where the noise was lower and tried to make contact with John with the mobile whip – no go! I therefore pulled out a squid pole and erected a SOTA dipole, connected to the mobile rig (IC-706MKIIG). Success – Errinundra National Park in the log for National Park #45 for all VK3 Parks worked. I then packed up and headed into Bright to buy some lunch, coping with the heavy traffic and eventually finding a spot to park the car. I considered my options after lunch. The weather was closing in – lots of cloud and strong winds up high, with rain at times. I also needed to think about what might be activated on the coming weekend – myself and some other amateurs were booked to stay at Mount Hotham with the goal of activating summits nearby. I drove over Mt Hotham in the cloud soup and on towards Bruthen. I considered activating Mount Elizabeth No 2, but as I was approaching the turn off, it started to rain. So I headed to Bairnsdale, stopping in for a coffee and chat with Rob VK3EK. Over the 9 day period, I also chased 37 stations whilst mobile. My Activator score went from 865 to 1015, plus my Chaser score increased by 449 points. I awoke early on Sunday morning and decided to make the effort to get to French Island. The drive is about 2 hours to Stony Point from Home. I arrived with just enough time to find a parking space, purchase my tickets and get to the ferry with about 2 minutes to spare prior to the 1015 ferry departure. Once at Tankerton, I walked off the jetty and to the south east, finding a spot with some tree shelter from the southerly wind., but still inside the French Island National Park. I set up and quickly started working stations on 40 m. I worked over 50 stations over the next 2 hours and a bit, comfortably qualifying the National Park activation for KRMNPA, VKFF and WWFF purposes. I packed up in a hurry and headed back to the jetty. It turned out that the ferry was about 30 minutes late, so I need not have rushed. The Easter and ANZAC Day weekend period had good weather and I comfortably activated enough summits to reach Mountain Goat on ANZAC Day. There were 3 bonus goals achieved: Reaching 45 Victorian National Parks Chased on Saturday 26 April thanks to John VK5BJE/3 in Errinundra NP; then making the trip to French Island for park number 45 as an Activator; and, finally, the French Island NP activation also qualified me for the recently introduced Grand Slam plaque for having both chased and activated all 45 Victorian National Parks! Thanks to all the Chasers over the past 2 years and also to all who have activated National Parks. This entry was posted in KRMNPA, SOTA and tagged French Island National Park, VK3/VE-029, VK3/VE-041, VK3/VE-051, VK3/VE-056, VK3/VE-059, VK3/VE-071, VK3/VE-076, VK3/VE-08, VK3/VE-090, VK3/VE-092, VK3/VE-097, VK3/VE-104, VK3/VE-113, VK3/VG-003, VK3/VG-026, VK3/VG-027, VK3/VG-031, VK3/VG-033, VK3/VG-036. Bookmark the permalink. You certainly had a busy Easter week, Peter! Congratulations again on the Mountain Goat, it was a real pleasure for me to be there to witness the moment.